How Jurassic 5's Cut Chemist, Vox Populi! and Pacific 231 fused electronic, hip hop and rock in the pioneering compilation Funk Off! The comp included obscure French oddballs X-Ray Pop, groove-laden spoken word from the US courtesy of Randal Kennedy (“Smith’s Room”) and Vox Populi!’s crucial “Megamix”, which didn’t so much blend songs together as rip them apart at the seams, using Revox reel-to-reel recorders to achieve a primitive scratching sound. On reading the LP’s liner notes, MacFadden discovered the existence of two additional releases, the C60 cassettes Alternative Funk 1 and Alternative Funk 2, which only piqued his curiosity further. He enlisted the help of “cyber digger” and longtime VJ Tom Fitzgerald to see what else they could get their hands on. They made contact with Vox Populi!’s bass player, Francis Lamont (aka FR6 Man) through Myspace in 2007, and began digging up acres and acres of tape (the majority of these releases being cassette-only) from Vox Man Records and other sources, acquiring added DIY extras in the form of fanzines, stories, drawings, elaborate studded cases and, in one case, even a free condom. 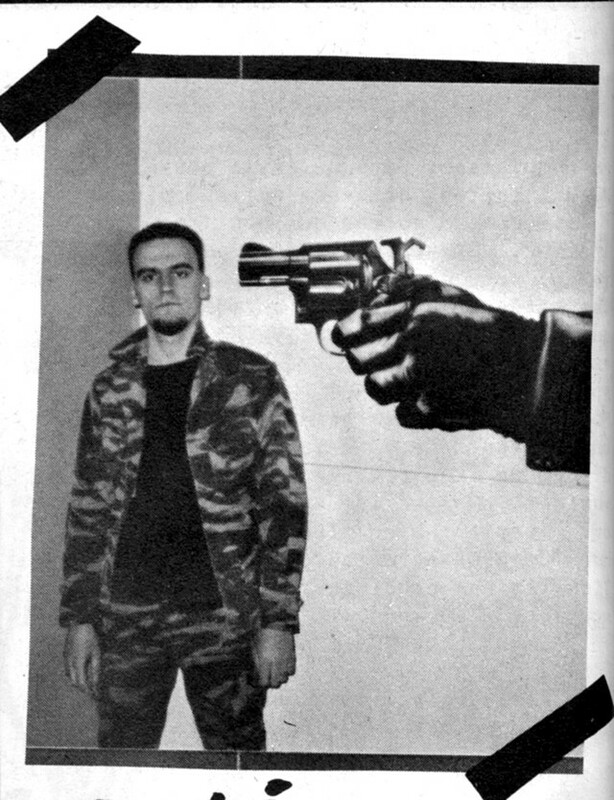 MacFadden had uncovered a sprawling pan-European collective of minimal-wave insurgents, with Kyrou at its core. “When I first heard Vox Pop I wanted to sample them and make more music with their music; I had this whole idea of becoming an EDM superstar using their material!” MacFadden says now. “But I thought it would be better and fairer to share it with the world instead because I liked it so much and because I wanted to make more people aware of their genius.” That’s exactly what he's done with the new compilation Cut Chemist presents Funk Off, 20 songs by Vox Populi! and Kyrou's collaborator Pierre Jolivet aka Pacific 231, plucked from obscurity to create a painstakingly crafted document of early-mid 80s French synth-punk/power electronics. There’s the sample-based title track, which, in the words of the record’s compiler, “had a familiar sound of early 80s hip hop beats” and made him think of ”'Planet Rock' on dust”. Then there’s “I, The Mad” – which features Ian Curtis-alike vocalist BWolf and which casts a cold Gregorian chant as the throb of tape delay waxes and wanes like a gothic moon. Kyrou released his first cassette aged 17 in 1982 after his parents gave him a Pro-One mono synth/sequencer for passing his baccalaureate. He soon began meeting likeminded others, including his wife Mitra and her brother Arash, with whom he would later explore fusing ethnic sounds with electronic music, something he’s still doing to this day. He struck up friendships with visual artist FR6 and Jolivet, and set up Vox Man Records in 1984. Fyrou’s studio became a fertile breeding ground for this new movement of young French avant-garde musicians who were turning their hands to synths and making waves underground. “Drum machine waves,” MacFadden quips. Their output was close in kin to musique concrète and shared elements of cold wave, but at the same time still completely defies definition. “We just wanted to enjoy ourselves and to make whatever music we pleased, free from dogma and free from rules,” says Kyrou over a Skype call from Paris. “For me, freedom has always been the most important thing; although we do not live in a free world, in a musical world we can be as free as we want.” Kyrou planned the Alternative Funk albums as a way of channelling his love of Sly & the Family Stone and Whodini by sending out an open invitation for global contributions that reached as far as Canada. He received over 200 responses, which were then condensed down to the LP and two C60 cassettes. The sincerity of Kyrou’s intent was questioned among his peers, but he’s adamant that the funk element was never meant to be ironic; it was, to him, a serious endeavour. “It isolated me from my musical community as people despised dancing at the time – it was considered the most uncool thing ever.” Some 30 years later, the Vox Pop/Pacific 231 story is now being told to a wider audience for the first time, thanks to MacFadden. MacFadden ends our chat by going full circle and talking about records. I ask him about unusual finds or strange meccas. “The weirdest LP I’ve probably ever come across was put out in 1970 by the Sandoz Corp – a pharmaceutical company. It was promoting the use of tranquilisers and it came with two vials of the stuff. I didn’t even need to listen to it before I bought it; it came with medication so that was all I needed to know!